Television Critics Association Press Tour, Pasadena, CA – January 8, 2011 – PBS announced today the App Store debut of the PBS App for iPhone and iPod touch, featuring more than 300 hours of free video, including full-length programs. Also launching today, the PBS Antiques Roadshow game app, available for the iPad, iPhone and iPod touch, lets players virtually collect, appraise and bid on real antiques with new collectibles from different cities added regularly. 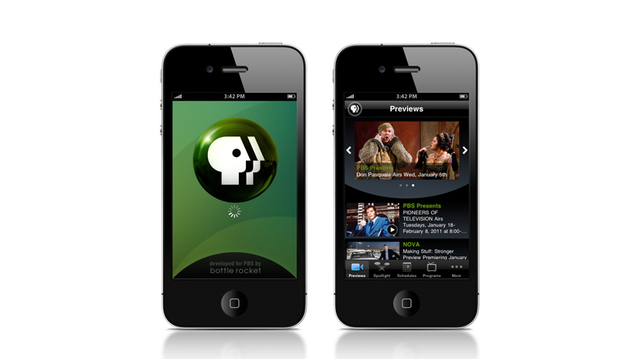 The PBS App for the iPhone and iPod touch features more than 300 hours of free video, including full-length programming from FRONTLINE, PBS Newshour, and others, as well as scheduling details, previews, and a new tune-in reminder calendar that can be synced with iCal. This app was developed by PBS and Bottle Rocket Apps and comes on the heels of the already successful PBS App for iPad. Based on the popular television series, the Antiques Roadshow App brings out the expert collector and appraiser in every Roadshow fan. Dozens of unique game challenges let players collect and store hundreds of virtual antiques based on images of real objects and actual values. Players appraise and learn about each item’s history and value. Expert players can unlock a free play mode and scoop up extra rare items for their treasure chest. The PBS App is available for free from the App Store on iPad, iPhone and iPod touch, or at www.itunes.com/appstore. The Antiques Roadshow App is available for $2.99 from the App Store on iPad, iPhone and iPod touch, or at www.itunes.com/appstore. Part adventure, part history lesson, and part treasure hunt, eight-time Emmy-nominated Antiques Roadshow marks its fifteenth season in 2011. PBS's highest-rated series, Roadshow is seen by more than nine million viewers each week. In each hour-long Roadshow episode, specialists from the country’s leading auction houses and independent dealers from across the nation offer free appraisals of antiques and collectibles. Host Mark L. Walberg welcomes back viewers to join the journey through America’s attics and basements, starting Monday, January 3, 2011 at 8/7C on PBS. Bottle Rocket Apps (www.bottlerocketapps.com) is a full-service mobile app development firm, focused on creating mission-critical, premium brand experiences on the Apple iPhone and iPad and on Android devices. The company’s apps have won numerous industry accolades for innovative and user-centered design, and frequently appear at the top of their categories on the iTunes App Store. The Bottle Rocket team of senior strategists, architects, developers and artists work their magic from the company’s offices in Dallas, Texas.